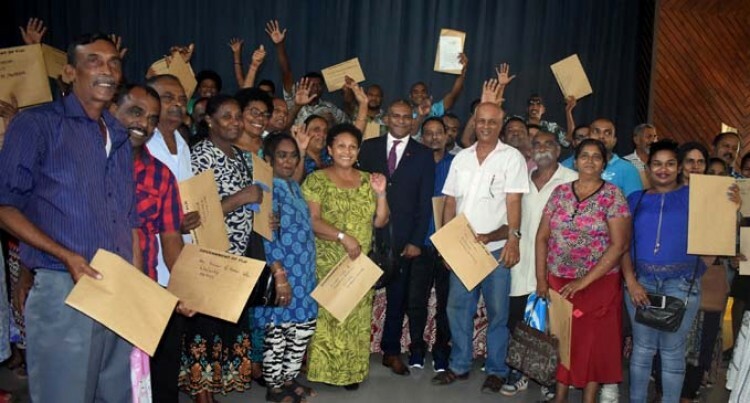 Minister for Lands & Mineral Resources, Faiyaz Siddiq Koya and residents of Nadi with their registered leases. Photo: Mereleki Nai. This is the moment I have been waiting for, says Angela Devi. Ms Devi said this when she and her husband Jitendra Kumar received their registered lease from the Minister for Industry, Trade, Tourism, Lands and Mineral Resources, Faiyaz Koya at the Ba Town Council Hall yesterday. They were among the 138 people to also receive leases from Mr Koya. Ms Devi, feeling overwhelmed, spoke about how happy she was and how she would speak to her children about their lease plans. Mr Koya told the crowd gathered at the Ba Town Council Hall that their wait was over. “I know that your wait has been too long and that is an understatement with respect to your patience and tolerance in this whole process,” he said. Mr Koya said 25 leases were issued for Rakiraki, 21 for Tavua, 25 for Ba, an addition 45 registered leases for Clopcott, Ba and 22 for Lautoka. He also urged the recipients to use their registered leases with honesty and integrity.